2018-19 Panini Prizm Kevin Knox Rookie Card RC Base #217 INVEST!!! ZION WILLIAMSON "FUTURE STARS" RC "DUKE BLUE DEVILS" ON FIRE!!!!! THE HUNT FOR SILVER ROOKIES!! NBA ROOKIES!! LUKA DONCIC! TRAE YOUNG! AYTON!! 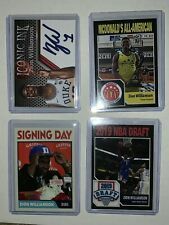 Zion Williamson Rookie "Spartanburg Day School Griffins" Duke Blue Devils HOT!! This page was last updated: 22-Apr 11:47. Number of bids and bid amounts may be slightly out of date. See each listing for international shipping options and costs.